The National Fire Protection Association (NFPA) has three product standards for chemical protective clothing. These include NFPA 1991 for vapor-protective ensembles, NFPA 1992 for liquid splash-protective ensembles, and NFPA 1994 for ensembles that incorporate both vapor and liquid-splash protection. When a user dons a certified ensemble, NFPA standards assure it is designed and tested to meet a specific hazardous environment. Specific benefits of NFPA standards include uniform product testing and evaluation; criteria based on specific end-user needs; minimum requirements for clothing design, performance, documentation, and labeling; and, required third-party certification for both initial product qualification and continued review of manufacturer compliance and quality. Throughout the past several years, the NFPA Technical Committee on Hazardous Materials Protective Clothing and Equipment has focused on evaluating the test methods incorporated within this series of standards to ensure they closely match operational parameters and to provide consistency in test employment using inter-laboratory and intra-laboratory validations. The most recent update of NFPA 1991 was released in 2016 and the new versions of NFPA 1992 and NFPA 1994 are scheduled for release in September 2017. Each standard had significant changes to address the gaps identified by the technical committee. Across all the standards within the purview of the technical committee, updated test methods were incorporated and a requirement was added to standardize Technical Data Package organization and content to provide enhanced clarity for the operator to make educated decisions. The 2016 edition of NFPA 1991 changes started with the title and scope to include response to CBRN terrorism incidents. This change, in parallel with the title change in NFPA 1994, will hopefully minimize confusion as to the applicability of both standards in hazardous materials and CBRN incidents. Permeation is now measured using cumulative permeation versus breakthrough times as this allows for the many types of permeation to be accounted for within a single test. Other major changes included the requirement for all ensembles that use an outer garment to meet an optional requirement be either fully integrated or permanently attached if the base requirements cannot be met without the outer garment. A visual acuity test and hand-glove function test were added to make the suits more operational. The 2017 edition of NFPA 1992 has a significant change in its scope whereby it no longer states that NFPA 1992 protective clothing and ensembles are not designed for use with known or suspected carcinogens and instead established the standard as applying to any chemicals which are not gas or vapor-producing liquids at concentrations known to be toxic to the skin. The chemical challenges within NFPA 1992 were changed to represent more operationally relevant chemicals, such as sodium hydroxide and sodium hypochlorite, as well as chemicals known to degrade materials, such as dimethylformamide and tetrachloroethylene. The 2017 edition of NFPA 1994 modifies the scope and title of the standard to include both hazardous materials and CBRN to minimize confusion as to the applicability of the standard for incidents that are not terrorist in nature. In addition, Class 1 ensemble requirements were re-established within the standard. The Class 1 criteria parallel those in NFPA 1991 but allow for both material barrier performance and overall design that affords for a more form-fitting and tactical-based product. 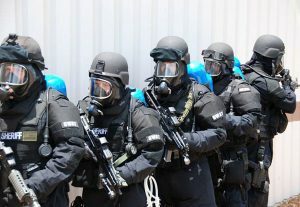 Ruggedized categories of certification (Type R) were added for Classes 2, 3, and 4 to address the increasing use of the garments in harsher environments, such as urban search and rescue and law enforcement applications. These criteria involve more rigorous preconditioning of ensemble material prior to material barrier testing and ensemble integrity evaluations, and higher levels of material physical property performance. The chemical challenges were modified to represent the vast diversity of chemicals found in the global chemical industry and to cover the breadth of fundamental chemical reactivity principles. Dr. Baxter is the current chairperson of the NFPA Technical Committee on Chemical Protective Clothing. Want to learn more about Federal Resources’ NFPA’s certified products? Check out Blauer’s Multi-Threat Ensemble, XRT Ensemble, and Saint Gobain’s Onesuit Flash for the latest in protective suits. Also, keep an eye out for Airboss’ newest style of chemical resistant gloves coming soon!